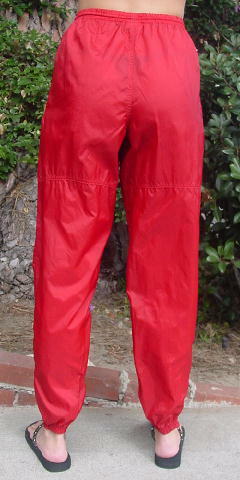 These somewhat thin synthetic dark red (the red is not as bright as it appears in the pictures) warmup pants are by Nike. 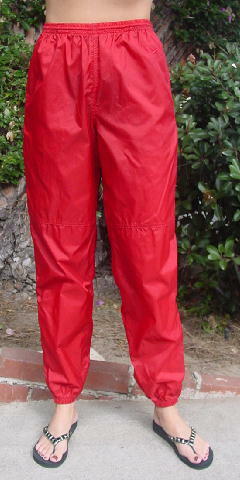 They have a 1" wide elastic waistband and interior red cord drawstrings. They have side seam slit pockets and the lower bottom outer side of the legs has 11 1/4" long zippers and the leg bottoms have elastic. The upper left front has an embroidered brighter red Nike logo. The tag says M, but they fit more like a size S/M.